This great forgotten 1980s science fiction show is coming back! Captain Power and the Soldiers of the Future is a legendary show, featuring a ton of scripts by J. Michael Straczynski years before Babylon 5. Now there's a plan to bring Captain Power back as Phoenix Rising, and here's everything you need to know about the new version. Top image: Drew Struzan. See the full version below! This show took place in the year 2147, in the aftermath of the Metal Wars, when humans fought the machines — and the machines won. Now, Bio-Dreads hunt down the last remaining organic humans and "digitize" them. The only resistance against the cyborg Lord Dread is Captain Jonathan Power and his squad, wearing power suits. Eventually, we learn that Captain Power's father and Lord Dread were friends, back when Lord Dread was an ordinary man named Lyman Taggart — and they disagreed about the best way to interact with technology. The show was financed by Mattel, and featured a lot of early CG effects. It was also very aggressively geared towards being a toy tie-in, including a gimmick where you could aim your toy gun at the television, and it would somehow interact with the action on-screen. Captain Power was my attempt to merge sci-fi and superheroes, two of my great loves. And beyond that, I wanted to create a show that would be groundbreaking. First, a story that would start in the ashes of defeat (for the human race) and show how a small group of warriors, with power suits that would level the playing field with the opposing forces, could change the course of the war. The idea that they would fight to preserve life against all odds was at the heart of the story. And then, the idea of a live action show with CGI created bionic “monsters” that the armored team would fight against – this was a radical idea at the time. CGI capabilities were not at the level to create “realistic” robotic creatures that could be composited into live action sequences. And on a weekly series! Live action heroes battling larger than life bionic “thinking” machines – in a weekly series – was considered impossible. And then, when we went to Mattel, they pulled out the interactive toy technology and said “can you work this into the show?” And I said, I thought we could find a way, but that it could not be a situation where the shows “featured” this technology. Rather the shows would work whether or not you – as an audience member – knew there was any interactivity. But here we were on a very aggressive schedule producing a series that was going to merge live action production with the CGI biodreads, a challenge in an of itself, and then we added this other layer of interactive technology for the Mattel toys. But that show was definitely ahead of its time. How is the show coming back? There was plenty of talk of a Captain Power revival in the 1990s, when Mattel still held the rights, and tons of ideas were batted around. But it took until now to get a take that everybody was happy with, with Mattel tentatively interested in doing toy tie-ins. Goddard's production company is pitching a new version of Captain Power called Phoenix Rising, with a pilot script already written by Judith and Garfield Reeves-Stevens (Star Trek: Enterprise, Primeval: The New World.) Unlike the kid-oriented 30-minute show from the 1980s, this would be a darker, more grown-up show featuring 60-minute episodes. A ton of concept art has already been created, and the show has been shopped around to some non-U.S. networks, one of which is seriously considering picking the show up. Original star Tim Dunigan is on board to return as the father of Jonathan Power, who appears as a holographic Mentor and gives Jonathan advice and support. Goddard says that the original show aimed to explore questions about what happens when machines can think, and what happens when a human brain is connected to a computer, and where humanity ends and machines begin. And of course, "What makes us human?" Now, 25 years later, Goddard says these questions are "more timely ever," with many people believing the Singularity is coming soon. People are already getting cybernetic enhancements. "We have transhumanist societies and clubs popping up in universities with young people actually looking forward to having bionically engineered “adds” to their brains and bodies." So in this new version, the Singularity is what leads to the machine uprising, and there's still the debate between Jonathan Power's father and Lyman Taggert over "what joining man and machine could/would lead to." In our new story, however, the Power Suits themselves are seen as another variation of thinking machines, linking completely to the human system of its wearer. More than ever, Phoenix Rising explores life and death issues, issues of what makes humanity different, or better or worse, than thinking machines? We explore the issues first introduced 25 years ago, in what we thought was a “scifi adventure” based on a world that could not really be. 25 years later we see we were close to the future than we thought (hopefully not the apocalyptic part), and so we decided to lock our story into the real events that are transpiring now. So is J. Michael Straczynski involved? The creator of Babylon 5 was a huge part of the original show in the 1980s, and his involvement is a big part of why people remain interested in Captain Power 25 years later. 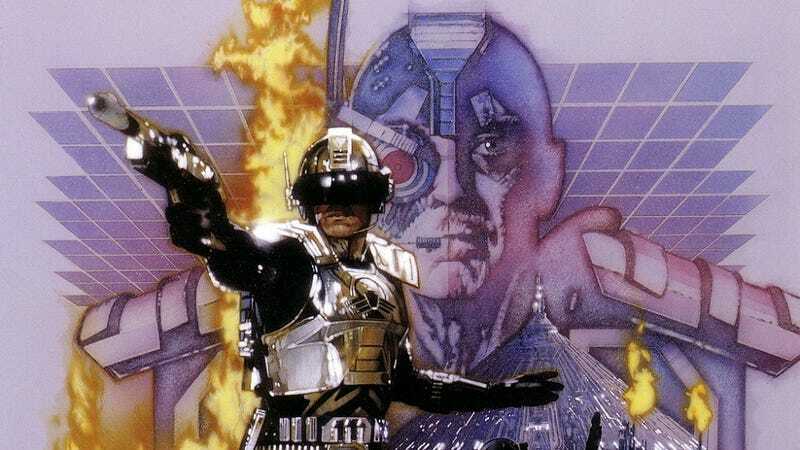 And when Captain Power finally got a remastered DVD set, with six hours of extras, a couple years ago, Straczynski was heavily involved in that, and his love for Captain Power showed through, says producer Roger Lay. But as for getting involved with a new Captain Power show, JMS was less interested. He told Lay and the other producers that he was happy with what he'd already done with the material, and he'd already explored what he'd wanted to do with it in the 1980s. At the same time, JMS did have an outline for a Captain Power movie trilogy, that he'd worked out with his Jeremiah collaborator Sara "Samm" Barnes. The first film would have been the story of the Metal Wars, the second film would have been about Jonathan Power's father, and how he helped to end the wars, and then the third would be the actual tale of Jonathan Power and the Soldiers of the Future. But the producers didn't want to do a movie version of Captain Power— they didn't want it stuck in development hell for years. And Lay says they wanted to be able to explore these recurring characters and intense themes in more depth, week after week, delving into "this in-depth mythology about humans who are in a very bad situation, and they have to pull together to survive." But while Straczynski remains proud of his contribution to the show, the movie was the only new version he was interested in doing. Lay felt like there was a lot of scope to go back to a serialized format, and have the chance to play out stuff like the cliffhanger at the end of the original show's first season, when Jonathan Power loses his headquarters, his team and the woman he loves in a catastrophic explosion, leaving him alone and bent on revenge. Says Lay, "We felt the original [show] didn't really have an origin story. It just kicks in with Captain Power, and you don't know who he is." There's nothing to explain who this guy is, and why he's a hero. This new version explores a little bit more of what makes Captain Power who he is, while keeping the mythology of Captain Power's father and his relationship with Lyman Taggart, who ends up becoming Lord Dread. "The Jonathan Power you meet in the first episode is not really the hero you remember from the first season" of the original show, adds Lay. "He feels like he's got a legacy from who his father was — but maybe it's not a legacy, maybe it's a curse." We'll explore the origins of the world, too, but Lay promises a "character-driven" show, in which we see the consequences of the characters' decisions week after week. It'll be more like Deep Space Nine than other Star Trek shows, because these characters won't be able to get in their starship and fly off to another planet — they'll have to live with the situation they've helped to create. When Gary first conceived of the series, he set it hundreds of years in the future because the whole concept of humans being at war with machine intelligence was the stuff of wild science fiction. But that's not the case anymore. The stock market's already crashed several times thanks to computers operating with a speed and logic we can barely comprehend. The military's contemplating giving robotic drone aircraft the ability to fire weapons without human intervention. The Internet's evolved into a vast global computer that uses Big Data to observe, predict, and manipulate our consumer desires and even our political beliefs. What all this means is that the personal challenges our series' characters are struggling with a few years from now, are the same we're all about to face today. So while the series bumps up the stakes with phenomenal action, its underlying themes are firmly grounded in present-day reality. Phoenix Rising is no longer science fiction, it's predictive fiction, and its stories and issues have never been more relatable, which is why we love it. Developing the show for a non-U.S. audience, without a toy partner heavily involved, means the producers have more creative control, explains Lay. "In the original, Gary had to deal with all these notes from Mattel," telling him to aim the show at a younger audience, tone down the darkness, and include a lot of toys. And Lay believes this new version can look more "grounded" than the original, which had the Bio-Dreads swooping down and "digitizing" people, sucking them into the computer. That was scary, but the producers believe in a post-Singularity world there could be "things that are far scarier than digitizing," ways of extracting the humanity from someone. "When you create these fantasy worlds, you have to at least ground it in something real," adds Lay. He really hopes this new show will fulfill the promise of what the original show was about, all those fascinating glimpses of Jonathan Power's world, without being constrained by the 30-minute format and the younger audience. "This all started because I am a huge fan of the original," adds Lay, who pitched the reboot to Goddard. Goddard also promises that there will be way better effects than the original, now that CG has evolved, and this new show will keep "the spirit and the characters of the original," while adding more complexity. Says Goddard, "We had to compromise greatly to make the original show happen because technology was just not there yet. But today, the only limit seems to be our imagination, but with our team of writers and designers, I don’t see any problems there. We are powering on with a new look, and a new world, created for a new generation of viewers."